When the cold weather hit during last winter, a lot of people who might otherwise have cleared snow from the pavements outside their houses were put off for fear of being sued. Is it legally safe to clear snow from outside your house? Where home-owners might once have helped make sure their elderly neighbours had clear access from their front doors, instead they sat indoors complaining that ‘elf-n-safety’ meant they dared not risk it in case the old lady down the road fell and took them to court. But were they right to be worried? The answer, according to the government, is ‘not unless they did something really stupid’. 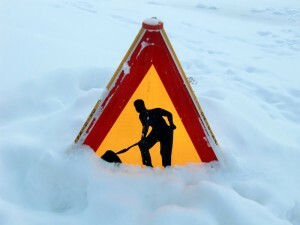 Advice issued by public service mouthpiece Directgov says: “There’s no law stopping you from clearing snow and ice on the pavement outside your home or from public spaces. What counts as ‘not carefully’? Well, the obvious one is using boiling water to melt away the snow. Yes, some people do it – and it’s a recipe for instant, invisible, potentially lethal black ice. Apart from that, or if you leave your shovel where someone could trip over it, you should be in the clear. As far as the law’s concerned, people have a duty to make sure they take care of themselves when walking on snow and ice. It’s not up to you to wrap them in cotton wool. There is actually something called the ‘Snow Code’ which, like the Green Cross Code and the Countryside Code, lays down a lot of guidelines that are really, when you think about them, just simple common sense. Clear snow or ice early in the day, when it’s fresh and hasn’t been packed down by pedestrians. Use salt at the end of the day to prevent overnight re-freezing. Don’t use water, use salt. And don’t pinch it from the council’s salting bins as that’s needed for the roads. If you can’t get salt, sand or ash provide grip, though they aren’t so good at preventing re-freezing. Keep salt off plants and grass, as it will harm them. When you shovel snow, don’t block drains or other people’s paths. Create a clear snowless path straight through the middle first as a work area, then expand outwards. Offer to clear your neighbours’ access if they have mobility problems, and check that any who are elderly or disabled are doing OK.
Notice that last one? Explicit government advice that you should help your neighbours if they need it. When coupled with the reassurances elsewhere about the legal position, it’s clear that the scare stories about being sued to Hell and back were just that – scare stories. Categorised under You and the law, tagged under Common sense, Safety.